Graduate and PhD in English Philology (Universitat Autònoma de Barcelona). 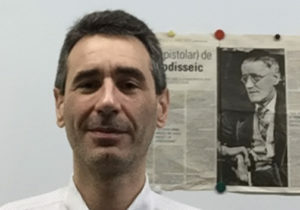 Literary translation researcher and translation teacher from English into Catalan in the Department of Translation and Language Sciences at Universitat Pompeu Fabra (UPF) since 1995. Teacher at the University of Aberdeen (Scotland, 1992-1994) and at the Universitat de Vic (1994-1997). Lexicographer and literary translator. Among my translations are an anthology of James Joyce’s letters (Cartes. Antologia, 2013) and a poetry volume by the 1995 Nobel laureate Seamus Heaney (La linterna del espino, 1992). Deputy director in charge of the Research and Development Area (Department of Translation and Language Sciences, UPF, 2018—); member of UPF’s Postgraduate and Doctoral Committee (2018—). Main research interest: literary translation from English into Catalan (20th-21st centuries), especially the Catalan translations of works by William Shakespeare and James Joyce. Other areas of interest: the translation of colloquial language and of phonic resources; pedagogical lexicography; literature written in English. Author of several books, among them: 1) Across the Frontier: A Dialogic Approach to Literary Translation, Poetry, Language and Identity in Contemporary Irish and Scottish Literature (2001); 2) Manual de traducció anglès-català (‘Handbook of Translation from English into Catalan’, 2003, as coauthor); 3) Easy English Dictionary with a Catalan-English Vocabulary (2004, as director); and 4) Traduir Shakespeare. Les reflexions dels traductors catalans (‘Translating Shakespeare. The Reflections of Catalan Translators’, 2007). Member of the editorial board of several journals and book series, among them: Biblioteca de Traducció i Interpretació (2014-2018); Reduccions. Revista de poesia (2015—); World Shakespeare Bibliography (international correspondent, 2017—); Romance Quarterly (2018—). Member of the research group TRILCAT (2009—).